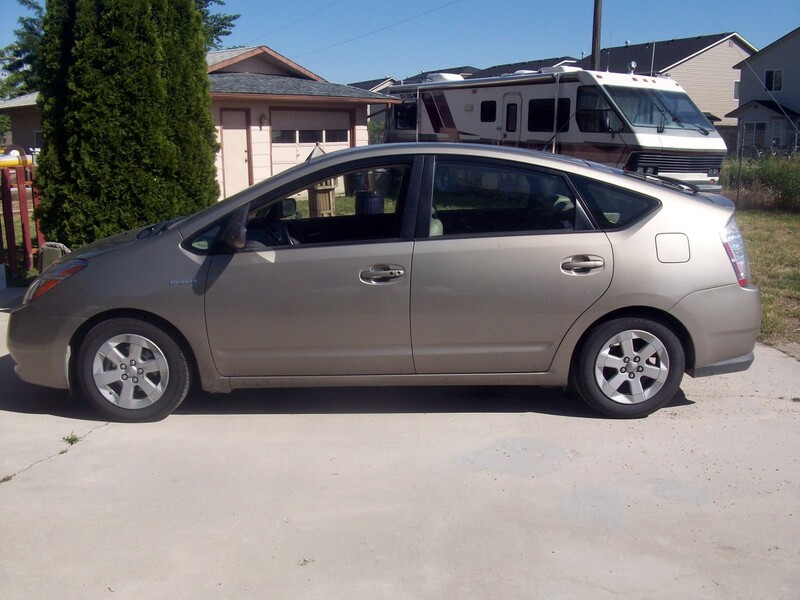 I had always been interested in the Prius hybrid as a different kind of vehicle, and when we decided a "new" car was in our future, that interest piqued in a big way. 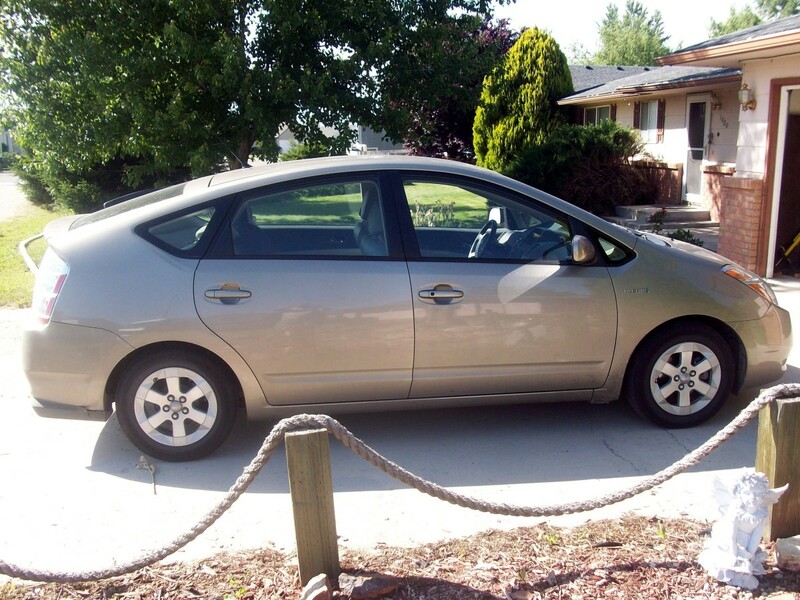 We test drove a local Prius that was for sale and liked it, but it was little beyond our price range. Additional looking found a 2006 Prius in Portland Oregon, some 420 miles away, with a price tag that was almost in our price range; a little haggling and we drove home with a new (at least to us) car. That was about 16 months ago and we've had plenty of time to evaluate our new set of wheels. Herein lies that experience, with the hybrid pros and cons of the Prius spelled out as well as the normal good and bad points of any normal car. When discussing a Toyota Prius, special considerations needs to be given to the hybrid pros and cons that will inevitably arise. Part of my past year has been spent researching this and reading all that I could find about such things as driving a hybrid car, the hybrid battery, and other facets of ownership and operation of a hybrid vehicle, specifically the Prius. Of particular interest was the hybrid technology in the Prius - it was the first hybrid vehicle designed to be a hybrid from the ground up. 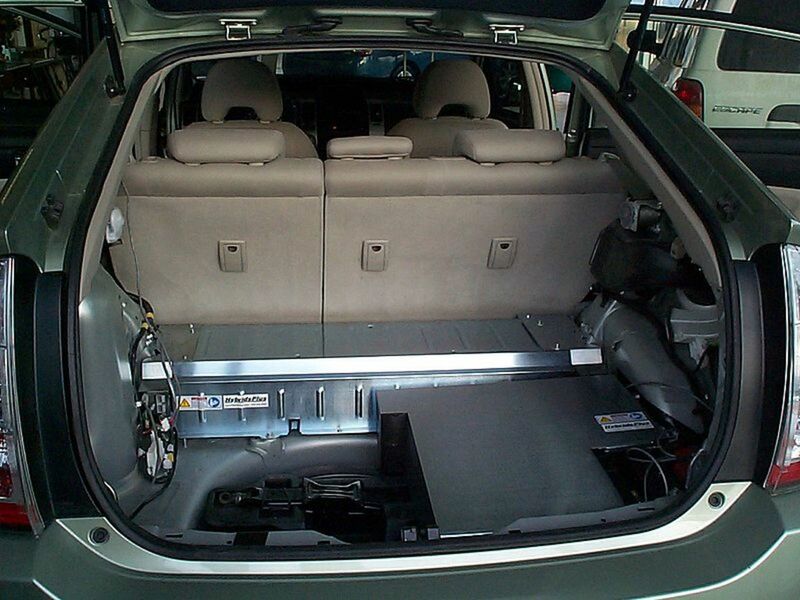 One of the major concerns is the hybrid battery in the car. 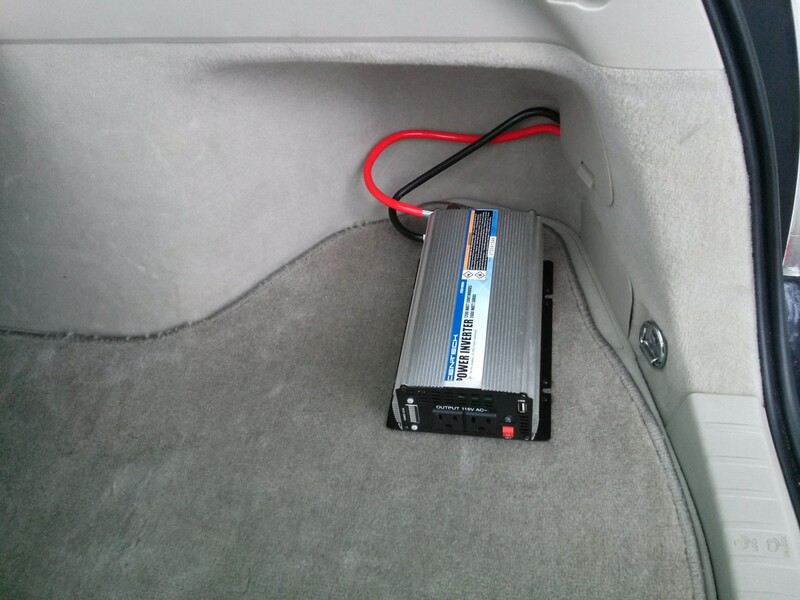 This is a large nicad battery of about 200 volts buried under the hatchback. "It's only good for 3 years or so and costs $10,000 to replace!" has been a common complaint, but is totally untrue. The battery is warranted for 100,000 miles (more in California) and a new battery is under $3,000 from Toyota with both used and rebuilt batteries readily available. There are more than a few documented cases of the battery lasting 300,000 miles on taxi cabs. "The voltage will kill me or the EMT working a crash!" is another claim with very little truth. There is indeed high voltage in the car - it is very carefully limited and protected. I have never heard a single instance of the high voltage wiring being cut, nor of anyone being injured by the battery. 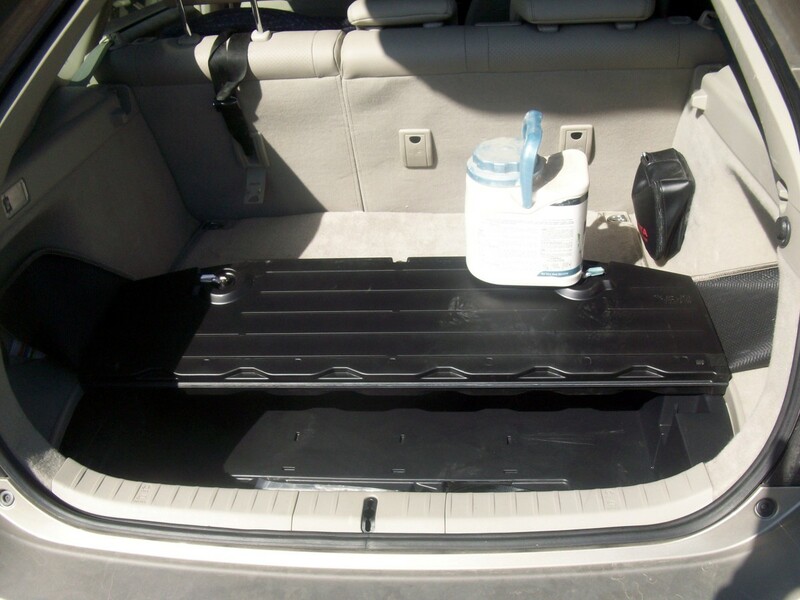 There have been isolated instances of fire from connections to the battery, but they are very rare and a normal car battery can and will do the same thing when shorted. The "transmission" barely deserves the name of transmission. It is a marvel of a design with two electric motors and no gear changes at all. Wheel speed is dependent on the speed of both electric motors and the gasoline engine, all put together. I immediately noticed a difference when driving it - if the gas pedal is pressed down suddenly the engine revs up a lot, but speed only increases normally. Engine speed does not change until the vehicle speed is fast enough, whereupon the engine slows back down. A strange feeling at first, but it does not bother me at all anymore. Reports of transmission repair are uncommon and usually involve changing the entire unit as it is difficult to work on. The rarity of such work, however, helps make up for the possibility of a battery change after 100,000 miles. Another consideration of this unique hybrid car are the brakes. The actual brake pads are rarely used; instead the regenerative braking provided supplies the majority of braking force. The brake pads only come into play on very hard braking or at speeds less than 7 miles per hour, but the changeover is transparent to the driver - I never noticed it right from the start. The result of this is that the brakes last virtually forever; 100,000 miles is the norm and some have reported as much as 200,000 miles between brake changes. Dirt and rust are a bigger problem to the brakes than pad wear is. 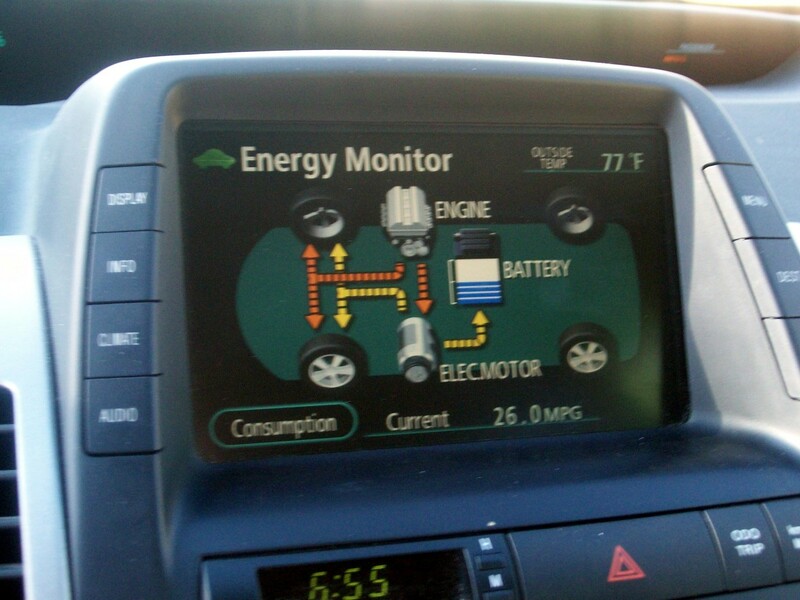 The Prius is equipped with traction control, but it is primarily to protect the electric motors in the transmission. 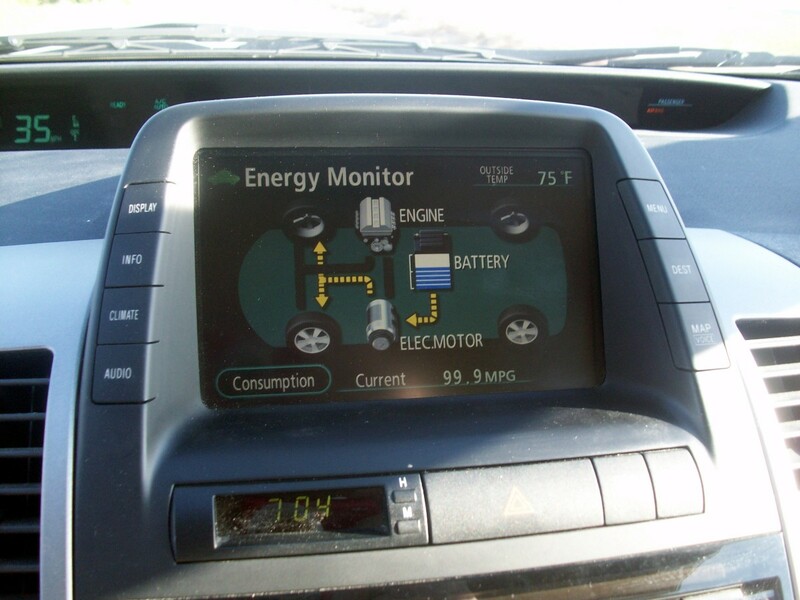 This was the only real "con" of the hybrid system - the Prius traction control is too sensitive, removing power before it should (I understand that 2010 and later models have improved here). This can make it difficult to climb a slippery slope at slow speed, but so far I have not been stuck in the snow. I did park on a slight slope once, forcing me to back uphill to get out, but eventually I was able to do it. 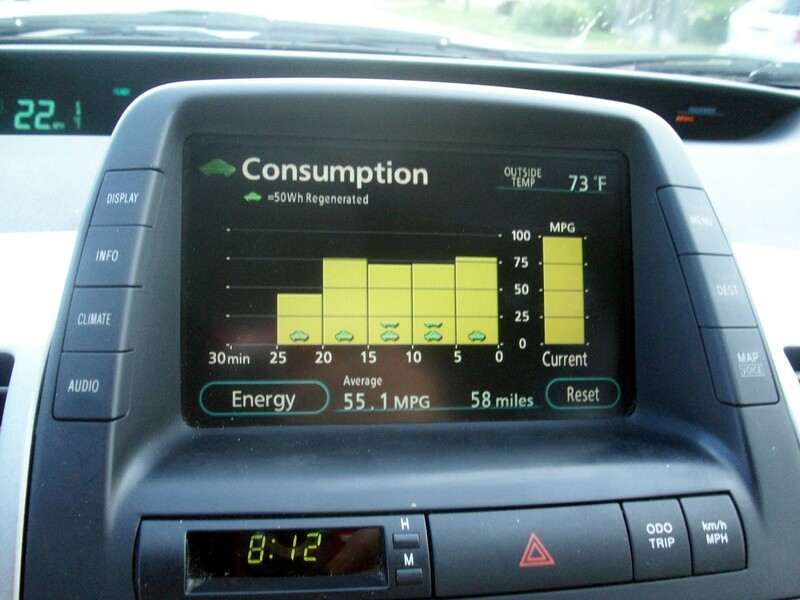 The Prius is also designed to be extremely pollution free. Many states, including my own, do not require smog tests on the Prius; as far as I know this is the only hybrid car that can make that statement. Toyota has accomplished this at the cost of some decrease in the mpg from the Prius, but it is not very significant and I would hope to see other hybrid vehicles follow their footsteps. It is nice knowing just how clean the car that I drive is. 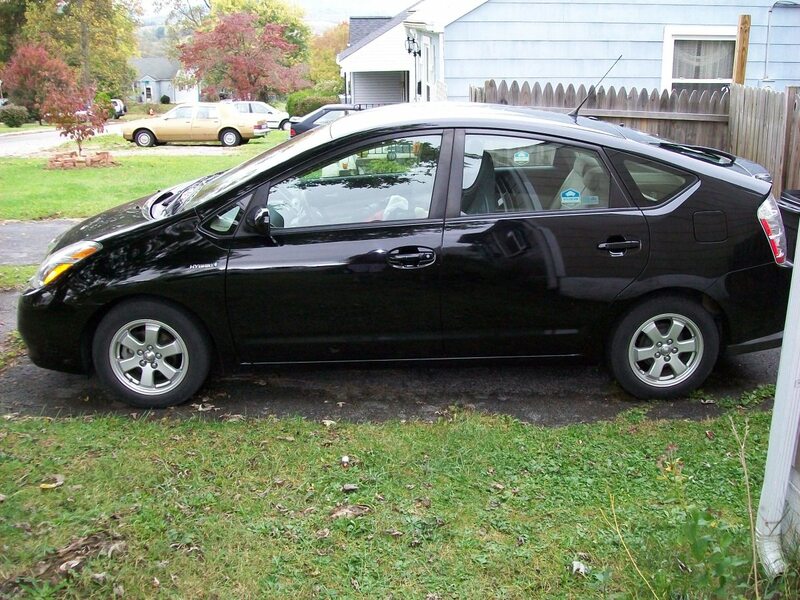 I found a few things about the Prius that I don't like - lets get them out of the way first. Driver leg room is a common complaint, and I agree. At six feet tall, I do not really have enough leg room to be comfortable. A few hours driving is not bad but a few days would, I fear, be another story. Many people have tried to modify the seating, but as far as I know none have truly been successful. The gas tank contains a rubber bladder as part of the emission control system and it regularly changes the usable size of the gas tank. Although listed, I believe, as a 10 gallon tank I have never been able to get more than about 8 gallons in it even with the gas warning light blinking. Not a huge deal - it is still good for well over 300 miles - but it is irritating. The antilock brakes are a little too sensitive, like the traction control. Braking while driving over a wet manhole or a slick spot in the road causes the braking to fail for an instant as the antilock system notes the sliding tire. This results in the feeling that the car jumps forward or that the brakes fail and while both feelings are false, it can be unnerving. The sensitive traction control can also be distracting if trying to quickly enter traffic from a stop in that the traction control will remove power from the wheels if it detects wheel spin in the slightest amount. This will cause the car to "pause" just when you are trying to move quickly. Driving over a bump, wet or snowy roads or a little gravel on the road will all cause this to happen as well. I've had to learn not to gun it hard to enter traffic from a stop. Although I have not experienced it, headlight failure on the 2006 that I have is common and expensive; although new bulbs are available on eBay for a good price they are not easy to change. This particular problem has been changed in the later years, however, and unless you purchase a 2006 you should have no problems with this. I have the HID headlights on my 2006 and while I like them very much there have been reports of the automatic headlight leveling system mounted in the rear of the car failing due to dirt and rust. Knock on wood - I haven't seen it yet. 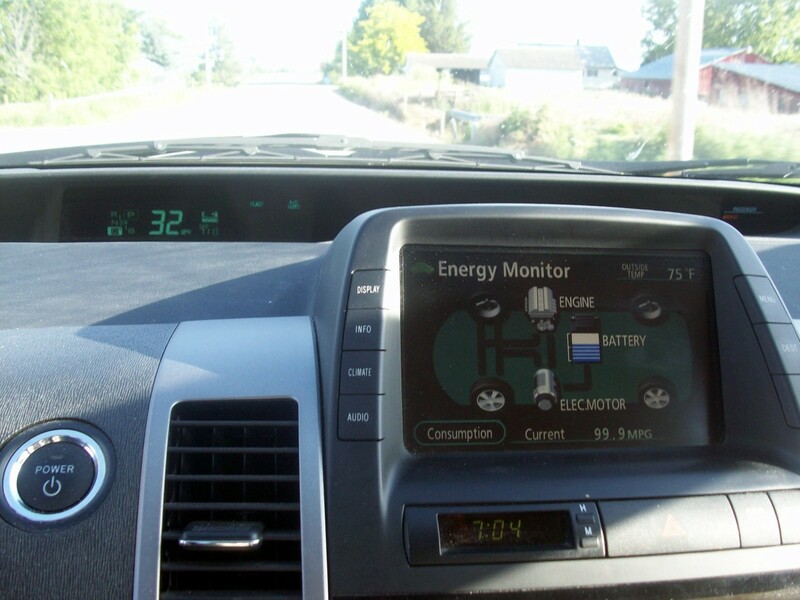 Overall my driving impressions our new Prius have been positive after the first days drive. We bought our car on a saturday in Portland, Or. and spent the night there. That night it rained and snowed and we faced some 420 miles of black ice and packed snow the next day to get home. It took us nearly 12 hours of driving to make the trip, but I was very pleased with the car itself. The Prius handled the ice and snow very well, never slipping at all, and did it with the OEM tires which are notoriously poor on slick roads. It didn't take long to appreciate the mileage from our new fuel thrifty ride. It has gotten to the point that I try to take my son with me when I fuel up - he drives a minivan and always ends up grumbling and complaining when I put my normal 8 gallons in and it clicks off. With a little training and effort, I have learned to consistently get over 50 mpg in the city and between 45 and 50 on the highway (always mountain driving in Western Idaho). See the picture showing mileage; the left hand bar is the first five minutes of the drive at about 40 mpg as the engine warms up while the next 20 minutes average around 75 mpg. 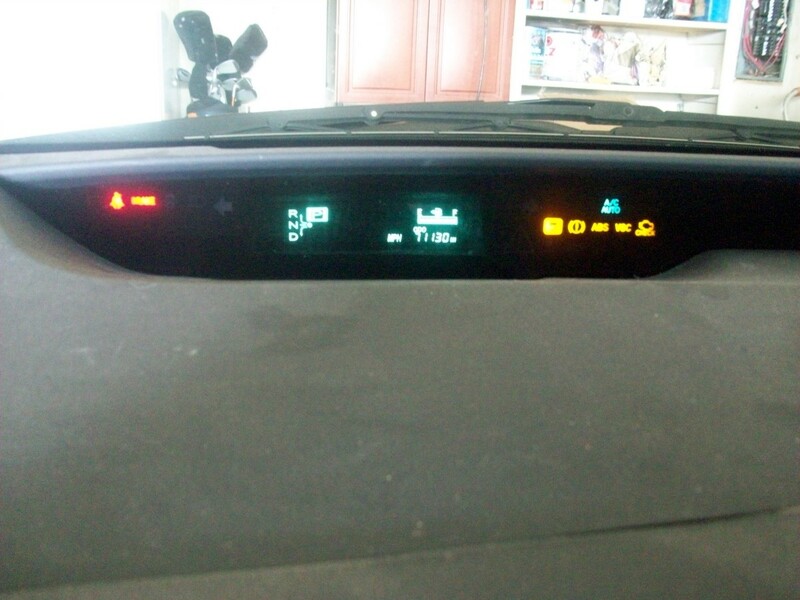 The miles on the current tank of fuel is shown at 51 miles while the average mpg for the tank is 55.1 mpg. Also note the speedometer in the upper left of the picture; it indicates 22 mph while the MFD shows 100 mpg. Heating and air conditioning are excellent, and although the climate control tends to run the fan faster than I like it is easy enough to slow it down. Living where we do it is not unusual to see either below 0 or above 100 degrees F and the system handles both quite easily. I had been concerned that with the small engine that it would take too long to heat up when starting, but that hasn't happened - Toyota provided an accessory heat system to prevent that. Instruments and controls are well placed but without a tachometer and I do miss that. The main instrument cluster is buried under the dash with a mirror system to project the digital readings up and out - this results in a cluster that is higher and further away from the driver which in turn makes it easier and quicker to focus on. Back seat legroom is very good for a midsize car, and the hatchback provides not only the obvious storage but a good sized hidden storage compartment as well. 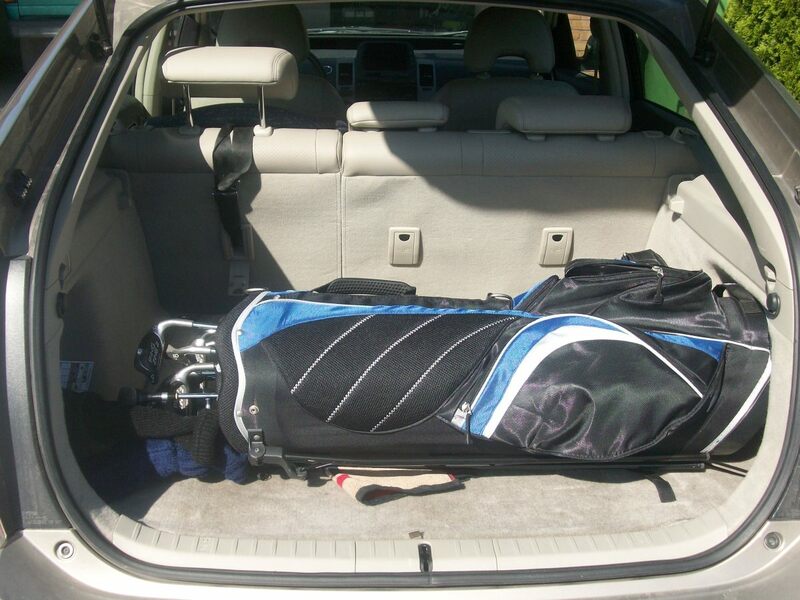 Three adults in the back seat would find it a bit narrow, but 3 children (one in a car seat) do fine. Headroom is good throughout the seating. I am pleased with the steering and handling of the Prius, although I'm sure a sports car aficionado would turn up their nose. Acceleration will not snap your head back, but is more than enough for freeway merging. Our Prius will climb a 6% uphill grade at over 70 mph; that is quite adequate for me and I've never had the cruise control drop below the speed limit anywhere in a very mountainous region. Top speed is limited to 105 mph but I never expect to see it so that is fine as well. Brakes are quite satisfactory outside of the glitch noted above. 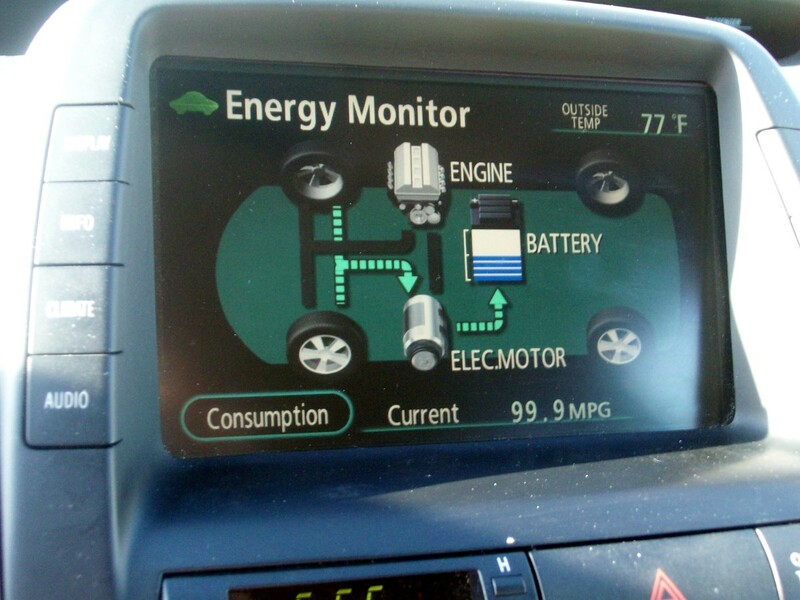 The MFD (multifunction display) is the most visible and obvious presence of the hybrid technology of the Prius. 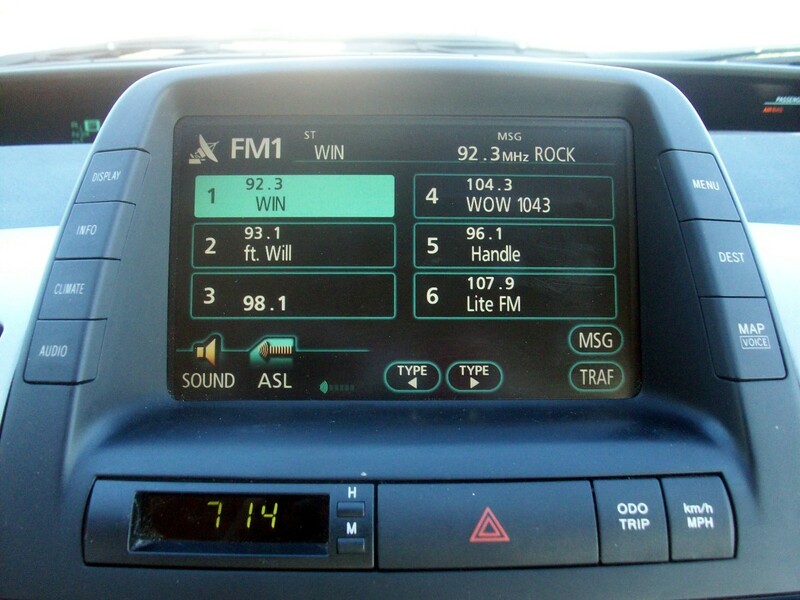 It is switchable between a wide variety of screens such as audio, climate control, telephone, GPS, two different energy screens, maintenance requirements and records. It also serves as the backup camera. The MFD has a problem, though, in that it is addictive! I generally leave it on the energy screen showing the energy usage and have to fight myself not to watch it all the time. I like to know what the engine and electric motors are doing as that knowledge can help increase gas mileage, but that is no reason to watch the screen instead of the road. Many of the screens I seldom use. Most necessary audio controls are mounted on the steering wheel, for instance. The telephone may be used with voice control or the speed dial section; all other functions are blocked off while moving. Climate controls for on, off and temperature setting are on the steering wheel, so for the most part that is what I use. One screen is to provide access to sub menu's - it cannot be used while moving and others adjusting the screen itself (brightness, contrast etc. are seldom used. Energy and the GPS screens are the exception and most of the time I already know where I'm going so that leaves the energy screens. 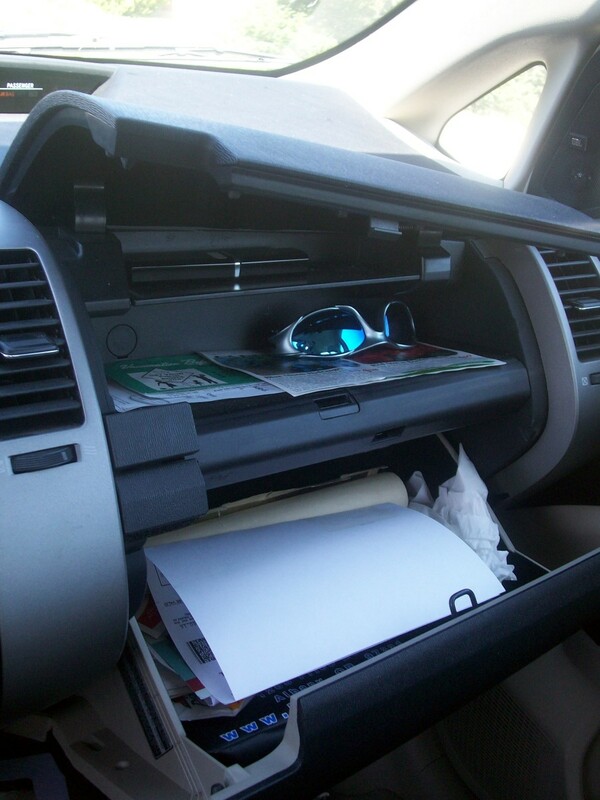 Some screens come on automatically, such as the backup camera when in reverse or the audio screen when that system is turned on. It reverts to the prior setting either after going out of reverse or after a few seconds in the case of the audio. I have learned to appreciate the MFD, particularly in the energy and GPS modes. Our new Toyota Prius came equipped with all the options offered except a touring package and I will try to cover them all. 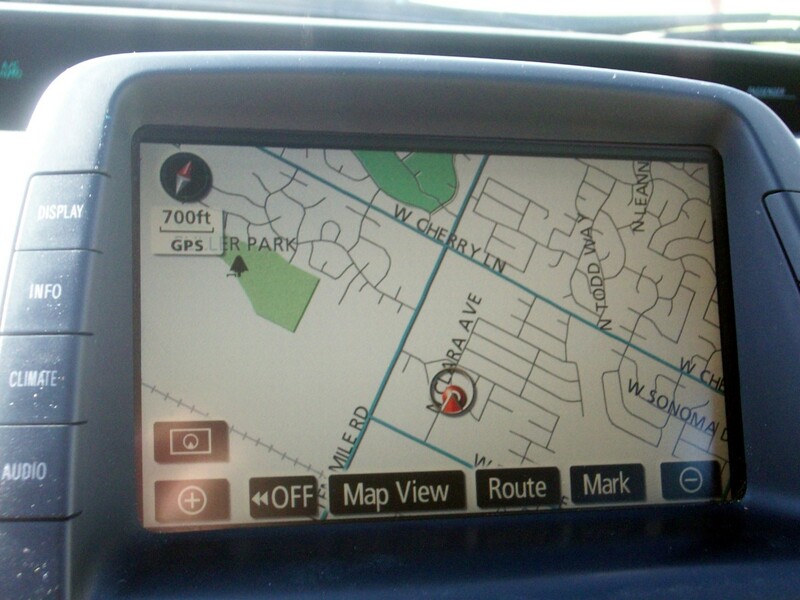 First on the list is the GPS map. I am a fan of these and own an aftermarket one for my other car. I am disappointed in the one supplied for the Prius, however. I love the large touch screen, but the maps are poor and route instructions worse. Main roads in my area that have been here for decades are not shown and I have had the talking girl inside guide me 10 miles out of my way rather than take a primary rural road. The GPS has always gotten me where I wanted to go (if it has the road) but seldom in the manner I would like. New destinations cannot be set while moving, even with a passenger along. Upgrades at around $200 are ridiculous and I don't expect to ever purchase one unless I can find it one on eBay that is a few years out of date. On the plus side it can be voice controlled, although that usually isn't worth the time, and the system will maintain its position when losing signal (downtown high rises, tunnels, etc.). Given that I can find an upgrade in the next year or three I will probably keep using the system; I like the large screen that much. Comically, I once left the system powered up during a ferry boat ride and for 3 hours it told me to "make a U turn" even while showing us in the middle of the ocean. The 6 speaker, 6 CD audio system sounds very good to me, but again a real audiophile would probably want something else. 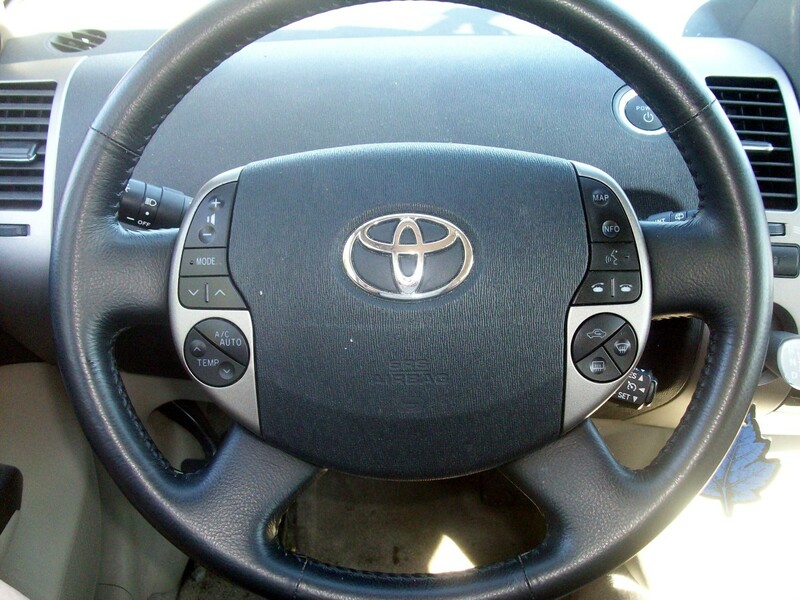 Steering wheel controls are available for volume and channel. 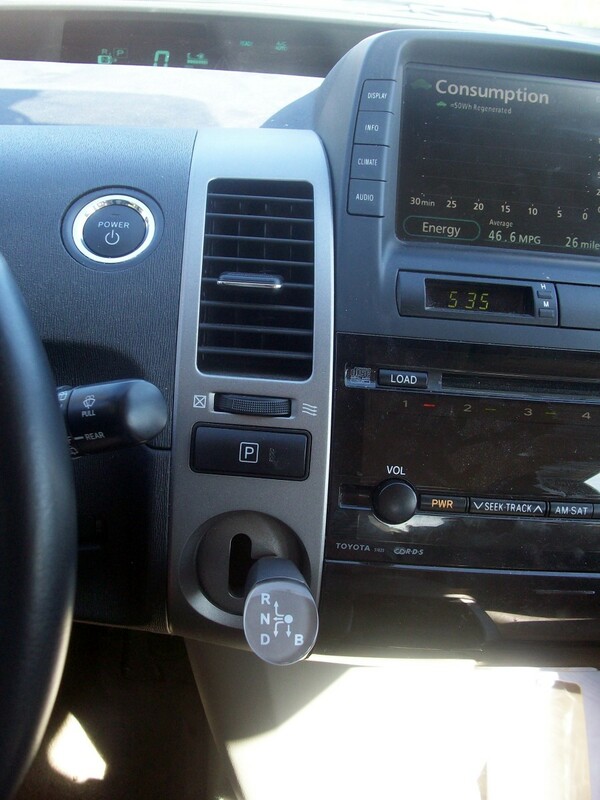 Part of the system is a bluetooth hookup to cell phones and is a very much appreciated option. I hate using a cell while driving. 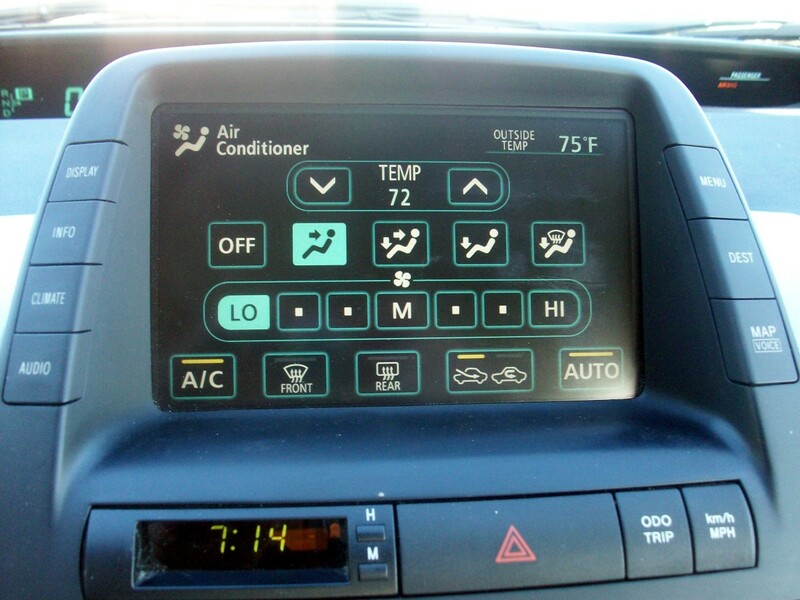 Probably the option I like the most is the Toyota's smartkey system. There is no key; instead I carry a remote like any other car except that I leave the remote in my pocket (or buried in the bottom of my wife's purse). Upon approaching the car with the remote in my pocket the interior lights come on. 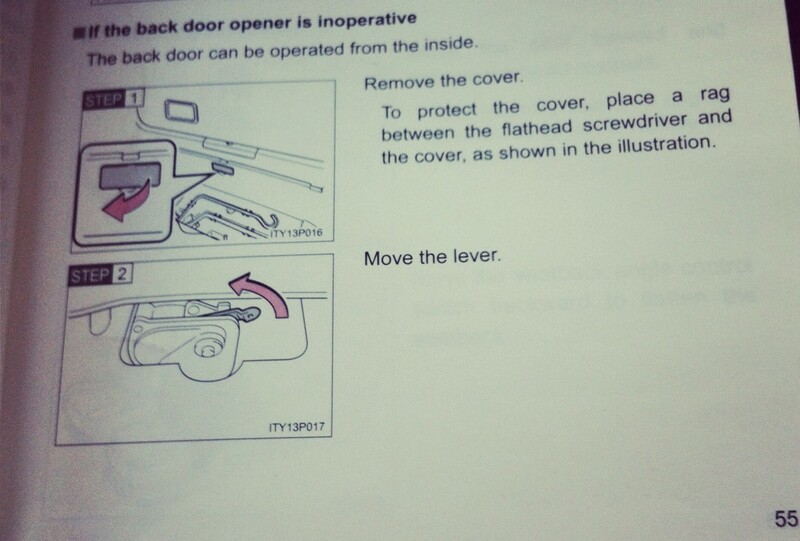 As I reach my fingers behind the door handle or touch the hatchback release the doors unlock and the door will open. (There is a small door key inside the remote fob in case the fob batteries go dead and the entire fob can be inserted into a slot in the car to start the Prius). To start the car, still with the remote in my pocket, simply push the "power" button. I'm kind of a techie - the idea sounded nifty before I ever used it and now I would hate to do without it. 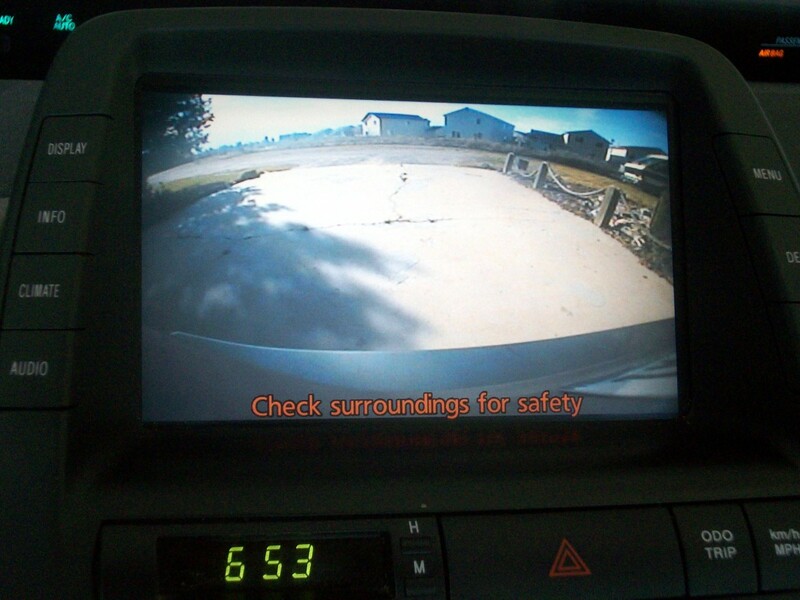 Part of the MFD is a backup camera - I check each time for small items, pets or children below my vision. A great safety feature. Lighting, both inside and outside, is very good. I have the optional HID headlights and find them much better than anything else I've used. The fog lights are well placed and useful. I have the optional homelink mirror that self adjusts for dimming. It works very well and I had no trouble setting it to open my garage door. The homelink is a nice little option, but not really worth much to me- the "clicker" that came with the door works just as well. Power windows, heated power mirrors and rear window defogger are nice and work well, although I'm not sure they were actually optional. An "option" that few people would think of - I have read of people leaving pets in the car in the summer heat with the engine on and doors locked. 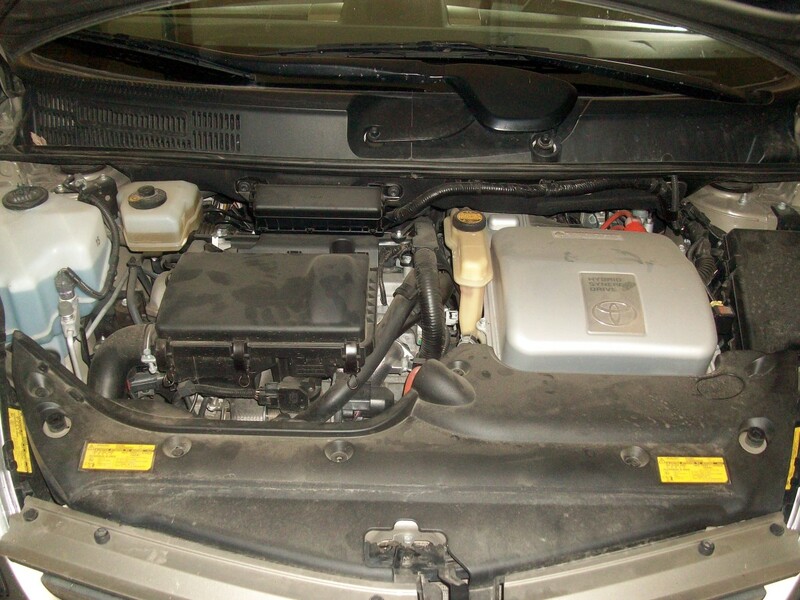 The engine will only operate periodically to keep the large battery charged while the air conditioner runs. Most of the time it is shut off; after an 8 hour hike one lady reported only missing about a gallon of gasoline. All in all I have been very please with our purchase. It has been somewhat of a learning experience to understand the ins and outs of the car, particularly how to maximize our fuel economy. While there are a few cons, they are indeed few and not of great importance. The driver leg room probably bothers me the most, but after a few hours driving I'm always ready to get out for a few minutes anyway. Although I have tried to make my home as energy efficient as the Prius, I doubt I'll ever make it. Would we buy another? I would love to have a later model - it has several major improvements while remaining a Toyota Prius Hybrid, with all that entails. It is our tentative plan, years down the road, to purchase a replacement as this one ages. *edit* Several years have passed and we have traded the Prius in...on a Chevy Volt rather than another Prius. While I still like the Prius, the plug-in Volt seemed to be a better choice for our driving patterns. A review of the Volt is also available if you are interested in the comparison. 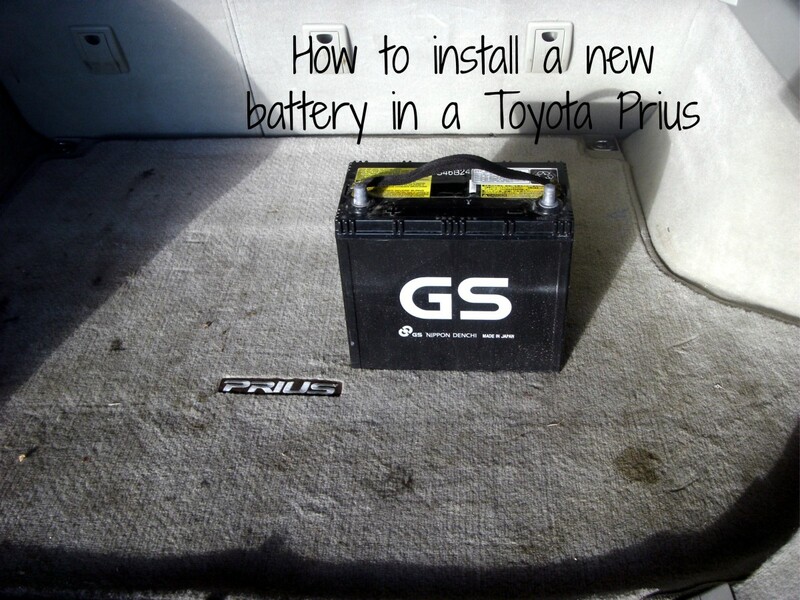 How can I recharge the battery in my Prius? A dealer may be able to do it for you, or you can simply run the engine. Take a drive somewhere. I agree with you - there are a lot of ways to produce fuel efficient cars and the hybrid is only one of the ways to go. There is no need to make a big deal of it like the lady with the sticker. Not all cars are a good match for their owners - that's why we make and use so many different styles. Diesel is one way but so far hasn't been made in a car I like and thus I prefer the hybrid. That doesn't make it a bad choice for everyone - just for me. If it were only about mileage we should all ride scooters! Thanks for the comment and compliment. Transportation is a changing field and I think we've only started down that road. Different thoughts are always valuable. Indeed, Toyota has a very lead on other hybrid cars, and will retain that lead for some time, I believe. Thanks for your comment. Toyota prius is still laed in the market of hybrid vehicle, this mean market still give trust to this variant from toyota. 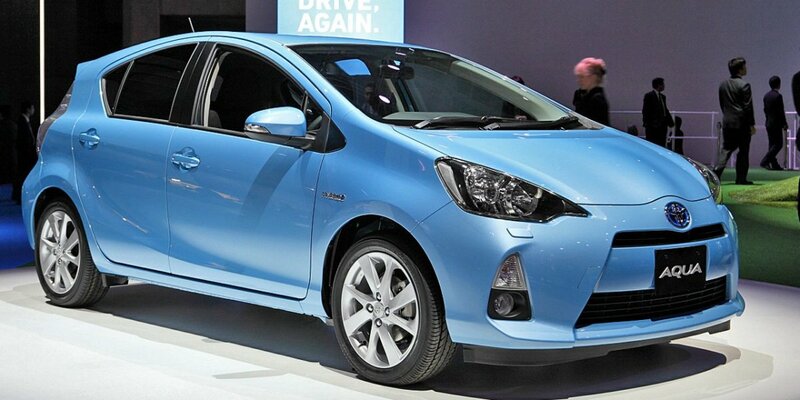 Toyota Prius have more than you ever imagine about hybrid car. And thank you, earnestshub, for the comment. It is appreciated. A good honest review. I read it all the way through. A well written hub, thanks. Thank you - I tried to cover the items I thought might be interesting to non-owners.